Arsenal are reportedly considering a late approach to sign Napoli right-back Kevin Malcuit following the season-ending injury to Hector Bellerin. 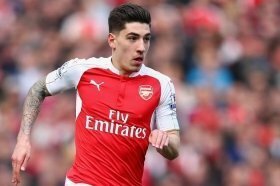 Bellerin suffered an anterior cruciate ligament injury during the league triumph over Chelsea earlier in the month and this has ruled him out for the season as well as the beginning of the next. Amidst this, Gunners boss Unai Emery has suggested that the club may not necessary spend on a replacement this month but The Sun claims that the club are after the signing of Malcuit from Napoli. Malcuit, who has acted as a deputy to Elseid Hysaj for the Naples outfit, only made the move to the Serie A in the summer and it is indicated that the club won't sanction his sale unless a permanent bid is made. Arsenal are currently limited to loan deals for the transfer window and this should hamper their prospects of signing Malcuit, who is likely to be valued more than the £9.6m spent by Napoli to recruit him last summer.